Dark and driven techno with an ear for the classic and an eye on the future is exactly what Theodore Elektrk and his striking style of producing and DJing represents. With a life spent almost entirely within the realm of the music industry, a passion for a broad range of musical styles and disciplines, and an unbridled enthusiasm for all forms of creative expression, Theodore stands out as an artist of a more eclectic persuasion. 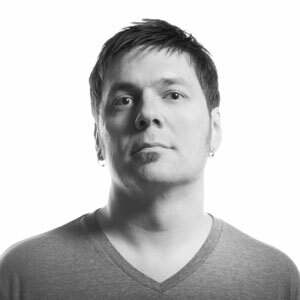 Born in Chicago, Illinois, he was exposed to the city’s vibrant electronic music scene in the early 90’s. It was an era that gave life to hard industrial dance music, via the iconic Wax Trax label, and the trademark jackin’ hard house that graced the airwaves of Chicago radio. Not long after, an opportunity to relocate to Milwaukee and release records under the artist moniker Master Control Program was realized. The city’s vibrant techno scene embraced a punk DIY ethic that spoke to his sensibilities and fueled his creativity. These influences shaped his voice as a producer. It’s apparent when you hear his original tracks, possessed with intense and hypnotic qualities that command the dance floor. His recent achievements include the release of his well received EP ‘Return To Sin’ on the stalwart Portuguese techno label Toxic Recordings in August of 2015. The wild success of that record led to immediate interest from other labels. His new single ‘Acid For Blood’ on Istanbul, Turkey’s Confused Man Records Two Year Anniversary V/A Compilation, is set for release in September 2015, and a pair of remixes commissioned by Toxic Recordings and Terminus Audio will be released late in the year. Those in the know have quickly realized Theodore’s reputation for delivering intense cuts of peak hour techno, that pack the dance floor in clubs and underground events, on a global scale. Whether orchestrating one of a kind moments for his audience in the DJ booth or producing hard electronic music that transcends modern trends, Theodore is an authentic and unique voice in the world of all things electric.